The Department of State of Alaska facilitates an online search tool for finding businesses and corporate entities that are registered with the state. To continue with the search, you need to have the Business Entity Name or the Entity ID handy. Follow the step by step guideline below to assist you in searching for a business entity in Alaska. 1. Click on this link to go to the Search Page (it will look like the screenshot below). 2. Assuming you decide to continue the search by entity name, let's enter the entity name in the required field. Also, you can specify your search by clicking on one of the radio buttons. For this example, let's type in the entity name "Bering Air" in the field and choose "Starts With". 3. Click on "Search" and the Results Page with a list of entities containing the given entity name given will appear (see the screenshot below for reference). 4. Click on an entity number. 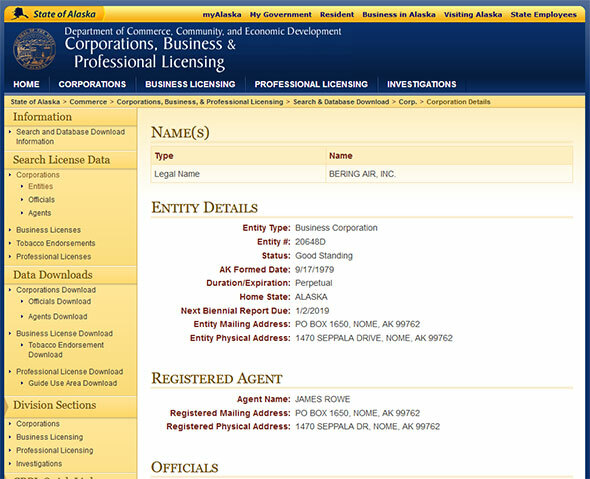 A page will then appear with the detailed information about the entity like status, type, filed documents and registered agent (see the screenshot below for reference). The state of Alaska doesn't have any Secretary of State. The functions performed by the Secretary of State in other states are taken over by the Lieutenant Governor in Alaska. The responsibilities performed by the Lieutenant Governor of Alaska include taking care of the state archives and the public properties. It also maintains records of the public documents of the state. 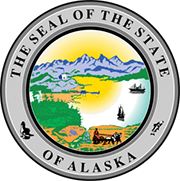 The Lieutenant Governor also guards the Great Seal of Alaska and is authorized to authenticate and attest government documents using it.